The WowLights 8 Port Outdoor Ethernet Switch allows you to setup an Ethernet switch near your display for connecting multiple E1.31 controllers. 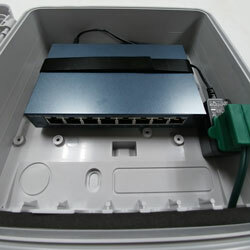 Includes TP Link TL-SG108E Gigabit Ethernet Switch mounted in an outdoor rated enclosure. Managed vs Non managed Switch: If you are running multiple Ethernet switches and using Multicast to communicate with controllers you need a Managed switch as your first switch. If you are only using one switch or all of your controllers are Unicast the Unmanaged switch is recommended.